Take this short quiz to test your defensive combat handgun knowledge against that of real experts. Which handgun is best for general self-defense, revolver or semi-automatic pistol? Which skill is practiced least, and yet one of the most important for combat handgun training? What is the primary advantage of carrying a semi-auto pistol over a revolver for self-defense? How many types of recoil or "kick" must you be able to neutralize in a defensive combat situation? What two skill areas are missing from most gun training courses? What is the number one factor that must be addressed and accounted for, and which demands that defensive combat training with a handgun, or any weapon for that matter, is different from sport or recreational shooting? To get the answers and Mr. Miller's 7 part series on "Defensive Handgun Training," click here and enter your information in the fields provided. Hi, I'm Jeffrey Miller, founder and chief instructor of Warrior Concepts International. Some of the most frequently-asked questions that I get about street-real self-defense focus on the strategies, tactics and techniques involving the use of, and defense against handguns. ...as long as an assailant can attack you with a gun, you must learn how to deal with that kind of threat. But, who can you turn to? ...they're going to get you killed. That's why I put together training courses that DO have the elements that you need to not only deal with, but to survive in real-world, life-or-death, self-defense situations where either, you, your assailant, or both of you are armed with a handgun. All of my courses are designed around my 30+ years of experience as a police officer, undercover investigator, private detective, and body guard. They're designed to walk anyone, whether you're in law enforcement, security, a branch of military service, or a private citizen, step-by-step through the important elements for surviving a self-defense situation involving handguns. And, now, whether you've ever attended one of my live training events or not, you can get the same lessons that I teach in my Defensive Combat Handgun Seminars on a new 3-DVD set. This 3 DVD set includes the basics in what I teach as the "4 Pillars of Handgun Mastery." Recorded during several of my live seminars, you'll learn the same lessons and gain the same insights as those who were there! 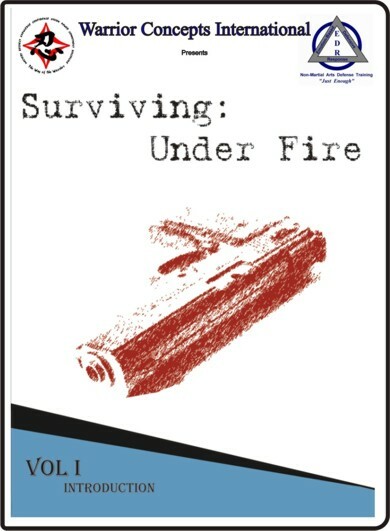 Disc 1: Introduction & "Live Fire"
...you'll even "go to the firing range" with me for actual live practice of the skills taught in the classroom. Here, you'll learn some of the critical skill-development drills I use to hone my own abilities. These drills and exercises will take your shooting skills from "good-ole-boy with a gun" to a self-defense practitioner serious about what it takes to survive a combat encounter! I guarantee that this DVD will increase your ability to hit your target more often, and with better - more dependable - stopping power and effectiveness! One of the most valuable lessons learned by many of my students is that self-defense with a firearm involves MUCH MORE THAN JUST SHOOTING! On this powerful DVD, you'll learn what you need to know for taking a firearm away from a dangerous attacker. The reality of the world is that, even if you're carrying a gun for self-defense, you may find yourself face-to-face with an attacker who has his weapon out first! What do you do when you're unarmed (or at least can't get to your own firearm in time) against a killer? The lessons on this DVD will teach you the secrets that will make you a survivor! Just as students are surprised to learn the concepts of disarming an armed assailant, the 4th Pillar of Handgun Mastery is the ability to hold onto your own weapon when a crazy, intent, or animalistic attacker is trying to take it away from you. 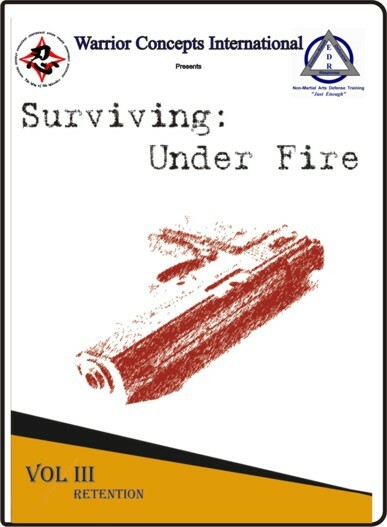 This DVD not only teaches you the principles for maintaining or regaining control of your handgun, but it also contains bonus techniques for dealing with multiple armed assailants where one of them is attempting to take your weapon or prevent you from engaging their partner with your firearm. This DVD alone is a live-saver! How much are skills like these worth? Students who attended these courses said the training was worth much more than they paid. A place in one of my 2-day combat courses will cost you $200 or more - depending on the topic. And that doesn't include your travel, food, or hotel expenses. My students include experts in their own rights, too. Many have trained with some of the best in the world - including John Farnum, the British SAS, and Israeli Special Forces. And, every one of them came away from my courses with information NOT covered by the others! Get your set of these powerful DVDs today and you won't pay the $200 plus course fee. You won't pay $150, $100, or even $90 either. The cost of each DVD is $49 when sold separately. That's a total of $147. But you won't pay that either. I've decided to offer the complete "Surviving Under Fire" complete set in this special, new-release promotional offer, for 34% off the regular price. That's a savings of $50! But, I can't hold this price forever. So, this special, introductory, promotional offer, expires at 5pm Eastern time on Thursday. After that, the cost of this set goes back up to the regular pricing of $147 plus shipping and handling. 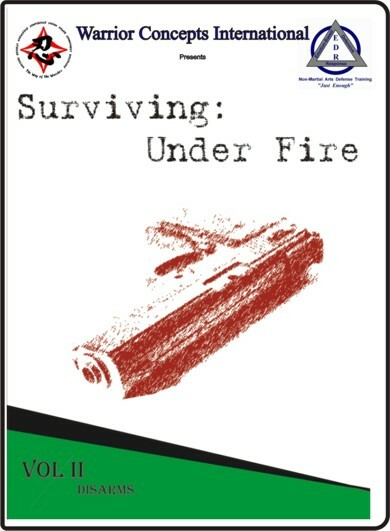 Each DVD is a complete, stand-alone course on a critical topic in mastering the use of the handgun for self-defense. Just like attending a seminar on the individual topic, but without all the travel and expense of doing so. Learn in the comfort of your own home! 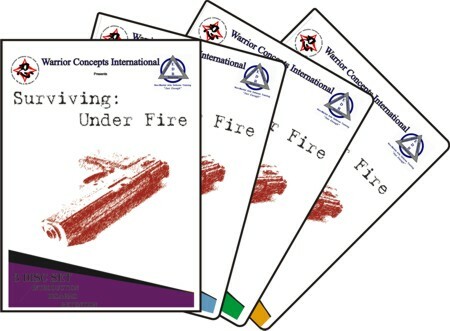 This special 3 DVD set is a must-have for any serious student of self-defense in Today's world. And, as a part of this special offer, it's yours for only $97 for the complete set. Buy the entire 3 DVD set and save $50, and get FREE SHIPPING! That's a 34% savings off the regular price! ...if you're already proficient at some of the skills offered in this set, you can order the individual DVD(s) that you need. Order any single DVD, and take $10 off the cost of individual DVDs in the set.... Only $39 each! for $50 OFF the regular price!